Backup software distinct purpose is to recover data after its loss, be it by data deletion or corruption. EaseUS Todo Backup is just such a backup and restore utility. It back up your entire system's current data, including settings, or just what you want it to, partitions or full disks, and restore your computer in the event of a hard-disk crash. EaseUS Todo Backup doesn't require any geeky fixing. 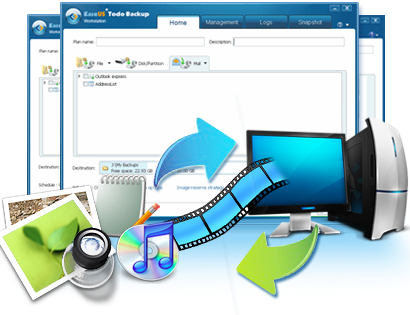 It is the most comprehensive free backup solution out there, supporting both file and image backup. It is easy to use and integrates well with Windows. The latest version 8.2 shows that the company has been steadily improving the product, albeit, EaseUS Todo Backup Free versions 3.5 and 6.0 strongly trails the current improvement. EaseUS Todo Backup displays nicely on the various drives and partitions on your system. And, it's also available in a $29 Home version that adds differential backup, as well as dedicated Outlook backup and restore. Including system snapshots, a ready-made Windows PE boot disk ISO, free support and for additional $10 you get the Workstation version that also supports dynamic disks, recovery to dissimilar hardware, and conversion of backups to virtual hard drives, as well as a license that allows for business usage. The software's earlier short-comings in the area of not responding as quickly as it once did has been restored in the latest version. Apart from a little advertising, there isn't much to complain about with the free version of EaseUS Todo Backup software. Mozilla rolled out Firefox 37 earlier this week with support for opportunistic encryption (OE), sort of a bridge between none encryption (clear text) and full HTTPS encryption. It attempts to encrypt the communications channel otherwise falling back to unencrypted communications. Albeit, It will not afford protection against an active man-in-the-middle attack compared to HTTPS. OE provides unauthenticated encryption over TLS for data that would otherwise be carried via clear text. Opportunistic encryption does not provide a strong level of security as authentication may be difficult to establish and secure communications are not mandatory. However, users, can at least get a modicum of protection from passive surveillance (such as NSA-style data slurping) with OE supported sites, as Firefox support is only half of the equation for opportunistic encryption. According to Mozilla developer, Patrick McManus, website owners will still have to enable support on their end for the feature to work, and has outlined two-steps to get up and running with OE. Firefox 37: Opportunistic Encryption (OE) better than HTTPS?